A lot of what I thought I knew has been upturned over the past couple of months; my pre-determined trajectory has been modified and I find myself in a new world. It’s been a stressful time and, most significantly, I am now a single parent of my two children. I realised that as life was becoming more complicated and exhausting, I might topple over and just plain lose it if I was not careful. Being present has become more important than ever. As the only grown-up around to take care of things, I knew I had to get down to business and cope and in order to right the good ship (that’s me, I’m the good ship), I needed effective strategies to steam ahead with my life – little kiddies in tow. I am not a zen kind of person. I don’t meditate or really enjoy yoga and when I hear women talk about self care, I imagine long lazy mani/pedi afternoons, solo movie experiences (that don’t include any kind of CGI animation) and dinners with friends full of laughter – all of which I just don’t have any spare time for. Right now, my life is a race, on a unicycle while juggling several balls. So what can I do to unwind? I stop for just a moment to feel the sun on my face. It’s my version of “smelling the roses”. I imagine the sun is giving me energy to continue on. I’ve got into the habit of this particularly when hanging out the washing – the briefest moment in my domestic Sun Salute has me feeling calm and happy. 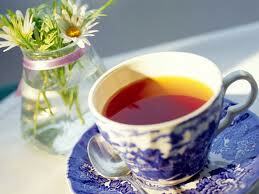 Instead of reaching for caffeine, sugar or any other pick-me-up, I nourish myself with herbal tea. It’s my ritual – this is something small I can do when I am feeling overwhelmed. It’s even better if I can find a chair in the sun to sit in while I sip. As much as possible, I sit down to eat breakfast and read. It takes 15 minutes out of my day but this practice is the gift that keeps giving. For one, I am well-fed and, while nourishing my body, I am reading something other than my to-do list or thinking about the kids’ many emotional and physical needs. I am distracted from the day-to-day, and I feel like I’m improving myself. Play music to loosen the mood. I am constantly amazed at what an energy-lifter music is. I put it on loud in the mornings to rouse my kids into the day, and we dance and sing our way through the boring routines. Recognise when you’re panicking – I often talk to myself (oh yeah, out loud and everything). Acknowledging where I am and what I’m feeling can give me great insights as to what you need in that moment. I try to fill my cup first and let it flow over to support and love the ones around me. This is kind of the reverse of where I started as a parent. I would find my reserve quickly depleted by the needs of my family. When I put them in front, I would be more inclined to grumpiness and melancholy. I have now learned that the most effective way to take care of my children is to first take good care of myself. Have some healthy prepared food in your freezer for those crazy afternoons when you can’t cook fresh. Right now, in my freezer I have couple of serves of bolognaise sauce, chicken soup, some curries and raw homemade pizza dough – all of which I can turn into hearty meals in a flash. I play to my strengths as much as I can. I’m a pretty organised Type A personality and so, when I’m stressed, giving myself practical “list ticking” activities can be really grounding and beneficial. Treating the day like a project gives me a good start, middle and end. How do you get organised for the onslaught? I use a lot of technology to help me. Be it Skype meetings, working or shopping online, or my daily newspapers delivered to my tablet. I am a stickler for switching them all off, though, when it’s time to play in the park or relax. Technology is a blessing if you use it right, and a curse if you let it take over your mind. Happiness Central is a wonderful resource for mindfulness in a practical world. They have a smart phone app that sends me clever, happy thoughts at 10am every morning. The quotes are annoyingly spot-on sometimes, and are yet another reminder to stop, consider and accept where you are and strive to do better. No one sat me down when I became a parent and shared their secrets of how to get through the tough times. The mums I know are fantastic at juggling their family’s needs and pretty poor at meeting their own. What do you do to take care? I love this – it spoke to me! I have even gone out and bought myself some beautiful new teas so I can make those moments more special. Current favourite is an organic licorice chai, made old-school style on the stove. Thanks SL! Mindfulness is a fabulous thing. Sounds like you’re doing it right, Sarah! Thanks for sharing. Amazing article Sarah! Some really helpful tips. Thank you!! I went through a pretty hideous time last year and I too found that being in the now and being mindful and grateful for what I have was a wonderful way to get through the really rough moments. But my ambition is to be more mindful every day and not just use it as a tool for managing stress. There’s a great resource that I have enjoyed and found useful http://mindgardener.com/ – their guide to living happy is lovely.